In an earlier post I talked about a fabulous piece of art on the second floor of the American Museum in DC. I said I'd research it later. Well, this is what I found. I had hoped for the movie that played on a computer located nearby. A single image is hardly enough to appreciate this work. I was blown away! I was also introduced to William Christenberry's work while in DC and will post more about this later. Still, it was the Joseph Cornell exhibit that influenced me the most. Seeing this show for a second time only reinforced the feelings of meeting a kindred spirit. Cornell is KING! I finished the free-motion machine embroidery on the piece I stitched going to Washington, DC. I'm still hand stitching the one I started on the return trip. So, here's the newest piece in the series with its counterpart in collage. Yesterday I posted a few images on the Altered Book Yahoo Group. It is so wonderful to receive positive feed back from interesting people living all over the world. I am truly indebted to this site. I learned about Sheer Heaven paper, embossing powders, and other primarily "craft" ideas to which I would never otherwise have been exposed. There's been discussions on this site that have been quite thought provoking and very inspiring. I really thank all those who sent me messages. I've also created a "map" of the Blues Series to slip under the plate-glass table tops at Mac's on Main. I'm planning to drop them by the restaurant on my way to I. Pinckney Simons Gallery. Today is the last one of the "Stones, Bones, Fiber" show. Thus, my Archeology Project will soon be packed into its suitcases and stored in the back room--just in time for the next thirty-five spools to be added (they're almost done) and for the imaginary maps to begin taking form. Blues Series Goes to Mac's on Main! Today I installed my Blues Series at the popular jazz restaurant/performance center on Columbia, SC's Main Street. The piece will hang for the entire month of February, which is, of course, Black History Month. The photo depicts Chef Fatback with the image of my twenty-four early, female Blues singers. I've got two days to create a "map" that can slide under the glass table tops to inform the clients more about the art and about me! They've promised some publicity, but even if this doesn't quite pan out, it is an excellent opportunity to share my work with a brand new audience. I am absolutely elated. Around 7 PM, I drove home from the studio with Alex (who had been volunteering at CMFA). We went past the storefront and were thrilled to see the artwork from our lane of traffic! Within an hour of our return from Washington, DC, I was altering the Triptych. We found the "perfect" knife and fork at a Thrift store benefitting the animals of Fairfax County, Virginia. I think it looks great. Tomorrow it will be delivered to Margaret Nevill at Mad Platter (www.mymadplatter.com). From there, it will go to the graphic designer. I can hardly wait to see it in use to advertise the annual charity event, Dining With Friends! Steve and I have had two fabulous days in our favorite city, Washington, DC. I'm so glad we came. We'd both thought that trips would be far and few between after Mathias graduated from the Kirov (or UBA as it was called for four of the six years). I'd spent a week chaperoning a bunch of ballet dancers, including Mathias of course, during spring break. I visited all my favorite places, just to say good-bye. It was so sad. I figured I'd mourn the loss of our regular trips and go into "museum" withdrawal. That hasn't been the case, thankfully. This trip has, however, been entirely different. There's been no ballet but plenty of books. Though Steve had been to Quinn Auction House, I never had been. We drove directly there on Thursday for the "shelf lot" book auction. It was fantastic. All the shelves are numbered. Each shelf is sold as a single "lot". Most were grouped by subject but many were listed as "miscellany". There were lots of architecture, modern art, Mayan culture, ceramics, old auction catalogues, Civil War, birds, toys, Bibles, leather bound, Shakespeare, theater, pottery, European history, railroad, poetry, furniture, textiles, carpets, heraldry, hardbound fiction, etc. Most of the volumes were new, hard back, in great condition, and were arranged in desirable groups. It was easy to lose oneself in the process of looking at the selections. It was easy to forget the lots in which one might be interested. Taking notes was a MUST. There were several lots with very, very old volumes, 1600s and 1700s. Just the feel of their paper and worn covers made me want them. The auction itself was quite rapid with over sixty lots selling in under an hour. Everyone was seated in another room. The auctioneer simply called out the shelf number and started the quick bidding process. Steve and I were unsuccessful on almost all the lots we wanted. We sat on a nice oriental rug in the back of the room sipping a glass of provided red wine between us. We laughed a lot. Many of the lots we wanted went into the hundreds of dollars. We certainly could pick the best books! Amazingly, we got two lots, both for less than we were willing to have paid. One lot includes the future source material for my upcoming "fantasy maps". Soon, I'll have the Archeology Project back home and will be ready to continue bring it to a fuller life. On Friday, we went to the American Museum/Portrait Gallery and spent the entire day. It was wonderful just wandering around all three floors. The collection is vast and very interesting. Happily, we found some of our favorite paintings. We'd fallen in love with Thayer's Virgin Enthroned and his Stevenson's Monument (an angel) while they'd hung for years in the Renwick. We had no idea where they'd gone--and so many others from that Grand Salon at the top of the red carpeted stairs. Now we know. They're in the American Museum. I can't wait to tell Mathias. He, too, missed them last spring. Sure, Caitlin's American Indians are nice....but we preferred the variety and great beauty of these other works. It was especially nice to be so close to them. Hanging in the Renwick, they'd all been far overhead. In a grand foyer on the second floor is a most amazing mixed media piece called MVSEVM by a guy named something Beck. There was a video about the construction. I will research this more later. It was absolutely fantastic. I thought museum's inspired me! This is truly a remarkable obsession. We also enjoyed the presidential portraits, the portrait competition (51 pieces were selected from a jurying process that started with over 4000), and the exhibition on Josephine Baker. Later, we bought wonderful, inexpensive wine at Trader Joe's and had dinner in our Towne Place suite room. Today, we went to Quinn's other auction, the regular event with prints (loose and framed) sold before furniture, carpets, china, silver, etc. We were terribly interested in the several lots of Audubon birds. Most lots had ten each. They were put up early in the sale, but there was a problem. The auctioneers (a family business) were all very, very sorry...in fact, embarrassed. The estate from which these prints came had reservations about the sale just last night. Very high minimum bids were imposed. This sale was being simultaneously held on eBay and had a bank of employees minding various telephone bidders. Most of the Audubon lots did not come close to the newly required minimum bid. Some lots sold. One lot, with fifteen songbirds, even became ours! We also bought the Denton fish; which we really wanted. Amazingly, we were able to acquire a lot of nicely colored, early etchings. We were quite happy. To celebrate, we took the metro to DuPont Circle, had lunch at a newly opened Johnny Rocket, and went to the Phillips Collection. Later, we visited the Catholic Basilica to see the newly mosaiced dome over part of the center aisle. Tomorrow we head back home. It's been grand here. I hope we can continue to come, for both books and art! Dining With Friends and other art! The last two days have been quite "artsy". My head is still spinning with the rash of activity. It started yesterday after I had lunch with a friend. We met at Mellow Mushroom in order to indulge our appetite for pizza and because it is just across the street from I. Pinckney Simons Gallery. After lunch, we went to look at my art in the gallery. I was able to share the Archeology Project with someone who loves history, fine things, and supports art. She purchased Man's Fate, two textiles and a paper piece from the Archeology Project, two spools, and one of Janet's mosaics. Rick whispered to me that it was the largest sale of the show. The amount really wasn't my concern. In fact, I think talk of money so immediately is almost a little vulgar--too close on the heels of art's priceless beauty. What truly impressed me was that someone actually purchased one of my altered books. It is the first such sale I've made. It reassures me that this is time well spent. Someone wants to enjoy my art and the words I've selected to include! Today I went to the State Museum with another friend, an artist whose work and approach is entirely different from my own although she focuses on using fibers and creating books. Thus, I think we are each among one another's greatest fans. Anyway, we talked and talked. It was a great conversation. One of the subjects centered on the Southeastern Book Art Conference that is coming up this May. Hopefully, I will be able to participate. Finally, we ended up at Vista Studios because I was meeting Barbara Blau, president of DP Professionals (http://www.dpprofessionals.com/). Barbara was considering my artwork for her brand new, gorgeous office. She bought Leader at Rest from my African series. We are discussing one of my In Box pieces, a commission, for another space as well. I am to meet with her, in her office, next week. While in the studio, Margaret Neville and Travis Johnson came to "track me down". They were excited and soon I was overjoyed. Margaret had come to last week's reception and fallen in love with a piece--but for a particular purpose. She and Travis wanted to know if I would "alter" my Triptych and allow them to use it for this year's Dining With Friends poster (they spearhead this charity event). Would I remove the flowers and apply a knife and a fork? Why, yes, of course! So, off they went up the street to buy the Triptych. Within fifteen minutes they'd returned with the piece for me to alter! I've posted a picture of the Triptych as it looks now. 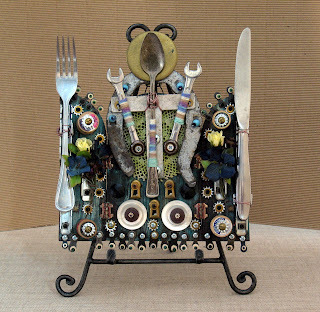 I'll be on the look out for the perfect knife and fork over the weekend in DC and post the resulting artwork later! It's been a good day. There was bad news though. The little "blemish" that had recently been removed from Steve's face, near the end of his eyebrow, had been cancerous. He now must return to the doctor's to have a little more tissue taken off--just to be safe, just to be certain that no cancerous cells remain behind. Hopefully soon, this will be nothing more than a small scar. I finished another piece in the "Elements of Architecture" series. This one is XXVII. I've uploaded it with its counterpart in collage. I've started the next one already and will stitching on it during the car ride to Washington, DC in the morning. Over the past month or so, I've leisurely been practicing my "imaginary text" in an old journal I found in a little used book store. All the pages were meant to be used as a sort of "day planner" by a physician. None had any writing. The book was evidently one of those "freebie" items given to doctor's by pharmaceutical companies. It was relaxing to freely draw "made-up" symbols. My mind would wander. Then it would land on a plan for the rest of my studio time. I also noticed that I tend to write several little markings over and over. If I keep at this, I'm pretty sure I'll find about twenty to thirty "letters" as if in a mysterious alphabet locked in my subconscious. Most people say the writing looks like Arabic. I think it's all the shorthand I tried to learn, failed to memorize, and it now trying to find self-expression. Last Friday Yellow Freight tried to deliver moulding to us. We had ordered two boxes from a place in New Jersey called Decor Moulding. One box, the bulk of the order, was intended for Stephen Chesley's larger oil paintings. (The show will be hung on Wednesday night). The delivery should have been made earlier in the week. The poor driver was very sorry about the situation; one box was missing--the box we needed for Chesley. We refused the order, wisely. Had we accepted it, we would be responsible for the entire freight charges despite one box being missing (odd, I wonder if I could still charge for a half-framed picture?). Unfortunately, this happened late in the afternoon. Decor Moulding closes early on Fridays. I was in Charleston making a delivery; Steve tried to handle it alone. Nothing was actually done. I had to handle it today. The moulding is still "lost" but Yellow Freight will not take any responsibility for the resulting problems. They've only agreed to pay Decor for the missing product--when they "officially" determine it is really "lost". They don't actually call it "lost" at this point (eleven days after picking the moulding up for a 6 day journey). They claim to be "looking for it". They say it is "reasonable" to consider the moulding "in transit" for double the amount of time a normal delivery would take. Thus, it won't be lost until tomorrow--at the earliest. They reserve the right to extend the "search time", even by a month or more. I asked lots of questions and learned that after a "claim" is filed, they will assign an investigator who "rapidly" works on the case. I asked what "rapid" meant. Generally, thirty days but it can take up to 120 days before a claim might be paid. I was also told, in no uncertain terms, that if I ordered additional moulding, this was MY CHOICE and MY FINANCIAL RESPONSIBILITY for all charges, especially for additional charges (like the Next-Day Air shipping). Basically, Yellow Freight hasn't "lost" the moulding at all. They are looking for it and might admit that it is gone four months from now---if proper paperwork is filed by somebody else! At that distant time, they will pay only the amount of the moulding--no penalty, no interest, no admission to have caused lots of extra work and expense by anyone else! In the meantime, Decor Moulding is filing the paperwork but my account still has an invoice for the order. Decor might not get paid for four months--FOUR MONTHS without the product available to other customers and without money. (While my account becomes flagged as "past due".) If the moulding is found, even on day 119, Yellow Freight only has to return it to Decor; they'd owe nothing. In order to solve the REAL problem, I had to place an order for the same moulding to be shipped NEXT DAY AIR. Yellow Freight won't even entertain the idea of paying the difference between their cost for delivery and the air charges. The entire thing is ridiculous. This is what has become typical of "service" in America. Few companies take responsibility for anything, even providing the product/service they advertise. Few companies care about the "real" problem and are only trying to watch their own expenses. There is no pride in these businesses; there is only staff training in "passing the buck" so that it never finds a desk on which to land. Okay, this is a rant. Mouse House has never operated in such a manner. I would rather pay the next-day air charges than let the problem trickle down to my client. That is exactly what is happening. At least I've taught my children to take responsibility for their actions and to try to overcome obstacles. This can be seen on Mathias' newly posted videos. He finally figured out how to upload videos to his MySpace. One features his incredible fall in Round One of the Varna International Ballet Competition. He even added words about dealing with a "screw up". He never tried to "blame the floor" or make excuses. He laughed about it even before he knew he would advance to the next round. To see the video, go to his MySpace. I don't understand many things about MySpace, but I know how to get to Mathias' one way: Click the provided link to my MySpace and then click on Mathias' profile. He is one of the few "friends" I have! Today, I went to my studio. I finished a little, altered book on which I had been working. It had been one of those "freebie" gifts for a doctor from a pharmaceutical company. This one, however, was from 1943. 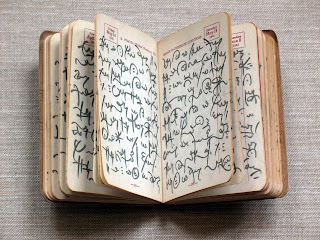 It was a daily journal. It had been blank. I practiced my "imaginary text" over every page, from January 1 through December 31. It was interesting to watch my own faux-handwriting and note which little "made-up" symbols I tended to repeat. I filled in the extra pages in the back, an accounting log of some sort and pages for additional patient information. The few people who have seen it think my writing looks "Arabic". Honestly, I think it is all the forgotten short-hand I tried to learn in high-school finding its own expression. I also heard a funny story about the evening of the reception. An old friend came to the gallery before 5:00 PM. She found two of the wrapped and stitched spools that featured Paul McCarthy and John Lennon. She was convinced that I would not have made only two Beatles---I must have created all four. She looked and looked but didn't find the others. She bought the two and requested the other two. I was floored. Frankly, I only knew that I'd made one with a Beatles image! I just didn't pay that much attention. I probably didn't recognize one of the faces as belonging to another Beatles at all. Yet, if someone really WANTED to purchase two more spools with Beatles, I could do this! I started looking around my studio for extra, wooden spools. I was hoping to find two. I found thirty-five. Inside the World Book Encyclopedia Yearbook from 1968 (I have 1962-1977 because auction houses and the Salvation Army refuse to take them! ), I found color images of the Beatles plus a picture from the movie "Yellow Submarine". I painting and collaged all thirty-five spools--four TOTALLY BEATLES spools. It's been a strange but productive day--thinking about Lee Malerich and rummaging through images that jump from the war in Vietnam to the mock-up of NYC's World Trade Center to the Space Race to the Cold War to mini-skirts to Maurice Sendak to Martin Luther King to lists of newly accepted "slang" words that I never even knew hadn't been part of the English language. Two posts ago I wrote about last Thursday evening's reception. I uploaded two images to go along with this post but never mentioned them at all. These pictures have nothing whatsoever to do with the reception or the show! I posted them because they are new, finished work from my "Elements of Architecture Series". Most of this series is currently at my solo show in California's Ironstone Vineyards. The two newest ones are XXV and XXVI. 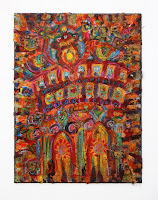 I make these embroideries by first painting a picture on cheap, typing paper. I use heat-activated paints (key ingredient!). Once the paint is totally dry, I turn it face-side-down onto 100% polyester and iron it firmly using the highest heat setting possible. (Actually, I use an old, heavy iron because they get even hotter than the new ones do!) Then, I hand stitch the polyester using heavy, bulky wools and assorted other threads. Finally, I put a piece of sheer nylon chiffon (the kind women use to wear over their hair curlers) over the hand stitching so that I can free-motion embroider into the threads. I zig-zag the edges. 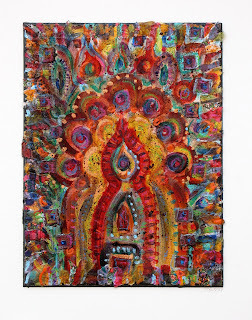 Anyway, since I'm not much of a painter, I have generally collaged the painting onto an 8-ply piece of mat board with other papers, paint, and oil pastels. I just finished creating 16 of these collages. Pictured with this post are the two that correspond to the recent embroideries! Last month I posted an image of the Archeology Project. I've talked about it for months. Until the last post, I never suggested that it was anything but wonderful. It is wonderful. But, I do want more. It can be better. It can grow to include "faux" idols, fanciful archaeological tools, more books, "personal items", vials and jars of mysterious contents, fantasy maps, a tent, a desk, etc. What I've got so far works. It functions just the way I envisioned it would. I wanted people to finger through the contents of these three suitcases, exploring the items, turning them each over to see both sides, and wonder about them. I wanted the individual pieces to suggest a unique, half-hidden story with their fragmented edges and various materials. I used antique prints, text printed in 1655, vintage stamps, Victorian beads, torn up pieces of old embroideries, and collages that included international tidbits. I made it to tap into the common feeling so many people experience when visiting a famous archaeological sight...that desire to take away something from the past, like a rock from Stonehenge, some gravel from Pompeii, or a chip from the coliseum in Rome. I posted images last month. 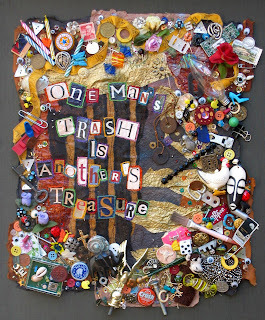 I'm posting this one to remind myself of where the Archeology Project currently stands....and where it needs to go! School kids all enjoyed a two hour delay in the start of their day last Thursday. Otherwise, the weather was only a bit colder than normal. I was easily able to deliver fourteen pieces to Corley Elementary School. The art teacher, Ms. Maybin, seemed thrilled to have the work. She promised to hang the little show and take photos for the local free publications that are circulated at the grocery stores. This all seemed so odd. I was delivering a "show" to someone who was willing to hang the work, make the labels, take photos and create the publicity. Sure, this isn't an opportunity that will ever find a place on my resume; but, the care and attention was professional--more professional than the arrangements with I. Pinckney Simons Gallery. That night, last Thursday, was the reception. It went well. People showed up, though not as many as would have come had the weather been better. Still, I was UNDER-whelmed. This wasn't the sort of exhibit with which I want to be associated in the future. These are not the gallery owners with whom I ever want to be represented. All the "problems" were really "problems". There are no real solutions....except not to do this again! I shouldn't sound quite so dismal. In truth, I was a "hit". Everyone complimented me, liked the Archeology Project and other pieces, enjoyed the brief gallery talk, and more than a few small items sold. Rick and Irene were quite pleased. In a sense, it was all "perfect"; only it wasn't. This is just not where I want to BE artistically. Before I try to explain, I ought to highlight the positive things....and there were some outstanding moments! First, Lee Malerich agreed to come to the show early enough to meet me for a drink at Motor Supply (a restaurant) before the show. Lee is one of the most outstanding embroiderers ever. 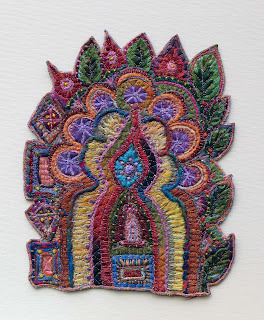 Her work has graced the pages of international fiber and craft publications. She's won the state's craft fellowship three time (after the last win, the award was limited to only two wins per individual!). She teaches now at Coker College in Hartsville. I have admired her ability to document emotions through thread and to pour out her heart and soul on fiber. Any time with Lee Malerich is a highlight! Another big plus in the evening came from watching people sort through the Archeology Project just as I had intended them to do. People were genuinely thrilled to find one "treasure" after another. Many begged for my comments on various individual pieces. I knew it was a success by watching the enjoyment and sense of exploration. While talking to the dozens of people who came, I couldn't help but to see past the immediate scene. I overheard comments too. These were the visions and sounds that "underwhelmed" me. It really is a problem that the gallery doesn't have a dedicated space in which to showcase work. Too many people entered the building and remarked, "Where's the show?" It isn't obvious. It doesn't look like a proper art exhibit. The place emulates a home setting. It suggests to potential clients what it might be like to live with original art. It is not a good gallery, however, to focus on a body of work. The owners really didn't hang the show, label the pieces, read the exhibition list, and know the artwork well enough to function as knowledgeable agents for the artists. They're nice people, but they are clueless. They relied on me to sell my work. This isn't how it is suppose to be. I saw my first poster for Radenko Pavlovich's LifeChance Ballet right before the reception. It includes a photo of Aleksander Buber with a the words "Gold Medalist" and an IBC Jackson logo. Aleksander Buber merited something in that competition, but he didn't get anything. He certainly didn't win gold. Yet, this is Columbia. My community allows such errors--even expects them, shrugs them off, and thinks that it doesn't matter. I hear it all the time---this isn't New York, as if that is a valid excuse for piling on mountains of compliments on a mediocre performance. I couldn't help but feel like I was part of this hypocrisy. I was part of a staged art exhibit that was a major "success" because.....this isn't New York...we don't have to present the best or even feel the need to try. I looked around the gallery and found it too pathetic. I want more. Part of the problem is the provincial attitude. Part of the problem is the gallery. Yet, part of the problem is me and my artwork. I know that the work is good. I also know that it is not good enough. If I am ever to escape the problems that I cannot change. I have to change the ones that are within my control. I really need to be more selective with the venues; but I also must concentrate on improving my work--going for more, aiming higher, and producing a quality that could have a place in a sophisticated, suburban setting. Otherwise, I'll end up all the "professional" ballet companies here in town--only good enough for Columbia. Mouse House has been so busy this week that I really didn't pay attention to the approaching weather. I've been preoccupied with framing, the upcoming reception at I. Pinckney Simons Gallery tomorrow, updating the Vista Studios website, insisting upon Alex's "grounding" because of poor grades, and producing new artwork. Today, however, the temperatures dipped. I am suppose to deliver about twelve pieces to Corley Elementary School tomorrow at 1 PM. They will hang for about two months for all the kids and school visitors. 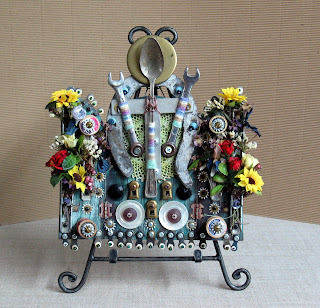 I selected several from a series made with assorted, trivial found objects. 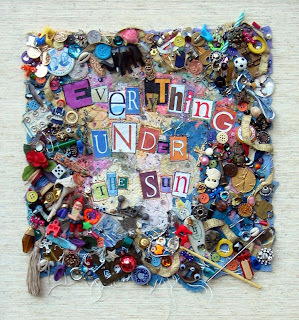 Each includes letters spelling a popular phrase like "Knick Knack", "Odds and Ends", "Pack Rat", etc. I confirmed my appointment via email today. The art teacher at Corley Elementary seems geniunely thrilled to have my work for this exhibit. Yet, she is a little worried about tomorrow. She gave me her cell phone number......"just in case". In case of what, I wondered? Well, by late in the afternoon, Dreher High School decided to call a two-hour delay to the school starting time tomorrow. An ICE STORM is rumored to be headed our way! The rumors now floating around the student population is that maybe school will be cancelled! This on the day of the reception. I cannot help the weather, but I do hope this is all a gross over-reaction---typical of Southerners who are terrified of snow and cannot drive in rain! I've arranged to meet one of my "goddesses" of embroidery before the reception. Lee Malerich is coming for the show. We are to have drinks beforehand. Here's to crossing my fingers and toes for fair skies! This week is the reception for the Archeology Project at I. Pinckney Simons Gallery. I think Janet put it into the Simons' heads that we need to have a gallery talk. While I could discuss my work at length and am generally quite entertaining, I think this is a rather poor idea. We've invited more people that the gallery can sufficiently hold. Obviously, only some will show up; but, it still could be a bit congested as there's not that much space to begin with. Also, the gallery doesn't have a dedicated space for our show. Thus, people will not necessarily be standing near our work while we speak. Plus, the set up of the gallery emulates a "home setting" with partial walls, furniture, tables, etc. There really isn't a "good" place in which to center such a gallery talk. I'm sure Janet just wants to do this. I'll play it by ear. In the meantime, I'm at work on my continuing Architecture Series. Maybe I'm inspired by the fact that my solo show in California is up and getting some attention. Though I have no contract and haven't the faintest idea what commission I'll be charged for sales, at least I didn't have to write and submit the publicity, design and mail invitations, hang the show, etc. etc. etc. Right now, I'm on the Ironstone Vineyard's website and the Calavara County website! So, I'm back to stitching buildings. More that stitching, I took the heat-transfer painted sheets I made in order to get the foundation color and design onto the background and collaged them--all sixteen of the recent images. Of course, I've only stitched six of these so far. I'm planning to take photos soon. First, however, here's Elements of Architecture XXIII and XXIV. I've got the next two done as well, just not photographed. It's been more than a year since the end of the reconstruction of the house after the fire. Naturally the "brand new" roof is now no longer under warranty. Naturally, there is now a tiny leak. Naturally, it is where we'd had past problems that were finally fixed before the fire. Fortunately, we have a great friend ready and willing to help. Image, Stephen Chesley, an internationally renown artist and my mentor, climbed up the 32' ladder with Alex, a staple gun, extra shingles, and all the other supplies necessary to make the repairs. They really made me nervous when their legs were hanging over the eaves. I've just finished the catalog for the Archeology Project. All 110 textiles have thumbnail images and description. All the primarily paper pieces, except the "Imaginary Text" sheets also have thumbnails and descriptions. It is ready to go. 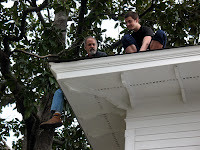 Oh, how did Steve and I repay the favor to Stephen for the roof repairs? 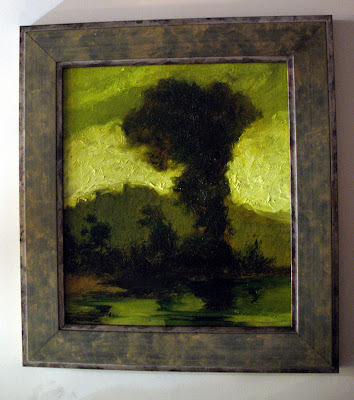 We used a long saved, hand silvered and patinaed moulding for one of his recent oil paintings. Stephen Chesley, Mike Williams, Ed Wimberly, and David Yaghjian are having the annual exhibition of new work coming up at the end of the month. One of the most amazing things is this is number 10,449! Okay, he's been creating work for over twenty years, but that's still about 500 finished, cataloged pieces annually! Stephen is amazing....and today he was a roofer! These are some of the images I recently took of individual pieces in the Archeology Project. Each photo is being used in the creation of the catalog. Each piece will shortly have a price. The range varies from $18 for the small spools to $28 for the wrapped-and-stitched nuts&bolts to $35 for a sheet of the "Imaginary Text". The textiles are going from $25 to $175. The paper pieces are from $35 to $125. This is the way I really wanted the Archeology Project. I wanted viewers to explore the contents of the suitcases, touch the pieces, fall in love with a special "treasure", and be able to purchase a "souvenir". I likened the experience to going to Pompeii or the Coliseum in Rome or to Stonehenge and being overwhelmed with the desire to take away a rock or a "relic" or sorts. This is the essence of the installation: discovery of a mysterious "historical" concept and fulfillment of ownership--even if it is a mere trinket. I couldn't be happier than to offer the pieces individually, to see the Archeology Project function as intended, and to create a running, open-ended catalog of the treasures it contained. The quality of these images isn't the greatest. I've shrunk each down for use in the catalog. Actually, the catalog's images are even smaller, just thumbnails. Generally, I keep most art images at 300 dpi and fairly large. These, however, are rather small, but nice! I can hardly believe that I haven't written since last Saturday. I've been on an emotional roller-coaster ride, mastered a few "tricks" on the Gallery 80808/Vista Studios website, and started a major catalog for the Archeology Project. The "roller-coaster": Pricing for the show at I. Pinckney Simons. First (before the show), Janet Kozachek wrote an email suggesting the the gallery owners were worried about how low my artwork might be priced. She strongly suggested that I allow the owners to "adjust" my prices. I felt like a "second-class"artist. I felt apprehension due to my inclusion in an elusive gallery. I felt like my "quality" was being questioned because of my affordable prices. I agreed to let Rick Simons suggest higher prices. Yet, when dropping off my work and hanging the show, he didn't seem interested in re-pricing my pieces. 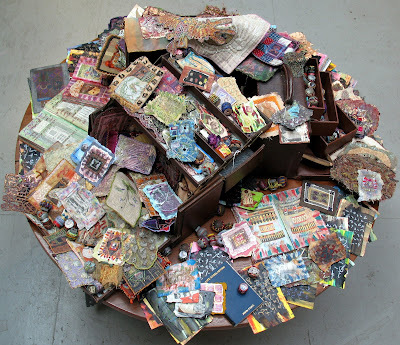 In fact, he admitted being unfamiliar with the average costs of artist- and altered-books and installation of any sort. Immediately after hanging the show and providing additional pricing tags (these tasks should have been the gallery's responsibility), I started getting email messages from Janet about the Archeology Project. She strongly suggested that I break the collection. She implied a level of dissatisfaction from Rick and Irene Simons, the gallery owners. I had priced the entire installation at $9,500. I never wanted to sell the entire unit, but the worries about my low prices prompted the change. Earlier, she had said that Rick and Irene regularly sold artwork at $8000. She reminded me that they would have to sell 10 of her $800 pieces to net the same commission. She implied that they wouldn't want to work selling some 100 pieces for mine at $80. Thus, I let Rick adjust my prices on other work and also priced the Archeology Project as a "high-ticket" item unit. Yet, Janet's emails were quite insistent. At first, I resisted. I reminded her that we had submitted the Archeology based work for a show at the Sumter Gallery of Art. Thus, I wasn't eager to sell the work anyway. She wrote back with a note that basically said only museums and non-profit spaces could afford to devote valuable floor space to non-collectible art projects. I was stunned. I was being accused (with nice words but still pressure) of WASTING commercial sales area. At this point, I started crying. I cried on and off for two days. I had been so happy to have the piece on view; then I wished I had taken the entire thing home. I wrote back to Janet to remind her that the piece WAS FOR SALE! In fact, with over 300 pieces for $9500, the average cost per item was just over $26. The piece, as priced, was/is a BARGAIN. Janet finally relented saying, "Fine". I haven't heard from her since. Still, I was upset and wondering if I was in trouble with the Simons. I had just hand addressed over 380 envelops with invitations inside. Each invitation also carried a hand-written note: I hope you can come. I was exhausted and insulted. I didn't know if I were even welcome to my own reception. Finally, I went to the gallery. Irene was there. Rick was in their gallery in Beaufort. They weren't upset. They didn't carry if I kept the work as a unit or broke it. They knew that breaking it would mean work. They were up to the task. They also said that Janet was just dying to purchase one of the individual pieces! Perhaps, a mystery had been solved. Since I always planned to sell the pieces individually, I photographed them--over 300 images (most had both a front and back). I've been working on a catalog ever since. Still, I don't care if any of it sells or not. It has been a labor of love--the fantasy dream of a fictional archaeologist (me)! Such a "professional" would naturally have an image and a description of all the "artifacts" uncovered. I created labels to go with any sold piece. 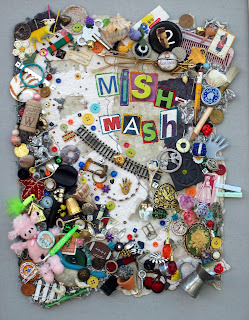 Each says: Artifact #_____Excavated by hand and machine by mixed media artist and fantasy archaeologist Susan Lenz in 2006. Formerly in the I. Pinckney Simons Collection. I'm assuming that the "unit" will not sell (even if it is a BARGAIN; it is still $9500, a lot of money!). I'm also assuming that only a few, if any, of the individual pieces will sell. I've been working on a catalog with thumbnail images for myself, for the Project, as if I were an archaeologist recording my discoveries. In the meantime, I've been working on the Gallery 80808/Vista Studios website. I've figured out all sorts of things. I've changed images for David Yaghjian and updated his biography. I added a resume for Sharon Licata under her one-paragraph biography. Then I figured out how to change the Calendar page and also the Featured Show. Successfully altering a website is a most elating experience. For someone who couldn't burn a CD last month, I've made remarkable experience! Buildings in Stitches at Ironstone Vineyard! The Ironstone Vineyard website has been updated with information about my solo exhibition and the RECEPTION! I'm thrilled. 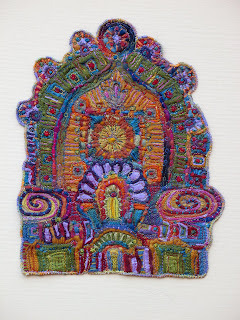 Susan’s Exhibit at Ironstone Vineyards is titled “Fiber Architecture: Buildings in Stitches” and will be available for public viewing and purchase in our galleria from 10 am to 5 pm. The exhibition will end with a fabulous closing reception also open to the public on February 24th at 5 pm that will include, wine and hors d’ oeuvres as well as a chance to meet the artist. 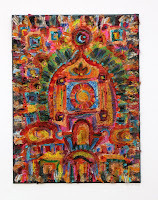 Collaging fabric, foiling, and transferring paint through heat-activated process provides fiber artist Susan Lenz a marvelous way to explore the world of architecture. Windows, facades, towers, staircases, floor plans, wall treatments, bays, domes, eaves, columns and archways overlap. 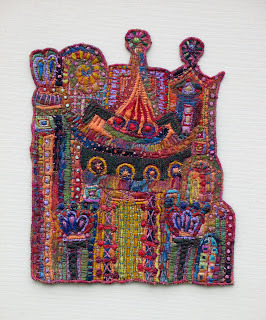 Historical periods and distant cultures relate and are tied together through free machine stitching. Many of the techniques used are very contemporary. Fabrics are manipulated and the materials are used in ways quite different than their normal functions or their manufacture’s instructions. The resulting artwork is more than just beautiful; it is interesting and leaves the viewer wondering just how it was accomplished. 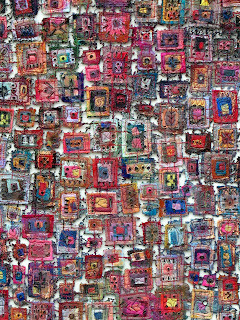 These new technologies are in the forefront of international fiber arts. The series is on-going and debuted at Gallery 80808 in Columbia’s Conagree Vista during September 2002. All pieces are professionally framed. The series is machine embroidered. 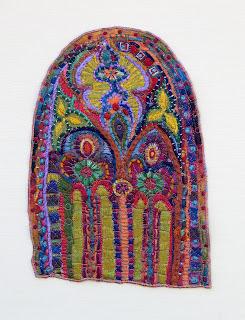 Additional pieces are individually titled and are hand embroidered or use a combination of hand and machine stitching. Well, this morning I am off to Charleston. My only "real" framing client--the one I still cater to with corner samples, hanging artwork services, and even office/house calls--is Leonard Long. It is my honor to work for an important man like Leonard. He has trusted me with this art collection that includes about fifteen original pastels by Elizabeth O'Neill Verner, a watercolor by Hutty, numerous oils by Linda Fantuzzo, and work by Manning Williams. I've framed three golf clubhouses, three houses, and several offices for Leonard. When he calls, I jump. Today, I'm jumping. Before I leave, however, I wanted to see if Blogger was uploading images at any pace quicker that a snail. It is. So, here's one of the other pieces that I'm submitting for the McKissick Museum "A Fool for Art" charity event. 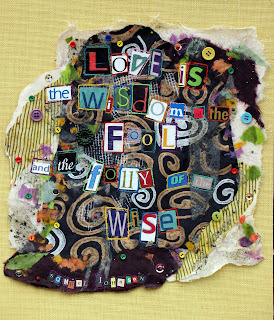 The quotation is by Samuel Johnson and reads: Love is the Wisdom of the Fool and the Folly of the Wise. 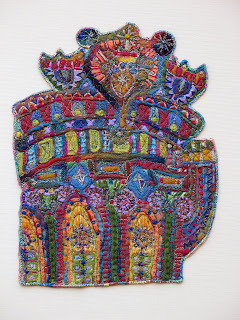 The piece is a paper collage with both hand and machine embroidery. Well, I read two chapters on de Kooning while uploading images. I forgot some of the statements I just wrote on the previous post. Likely, I need to add an explanation. I said something about being both "well" and "injured". Explanation: I accidentally fell down the back steps yesterday, ruined the pants I was wearing, bloodied both knees, and I couldn't stand for over five minutes. I've had to take aspirin to get over the pain, but otherwise I'm quite healthy and I feel much better today! I also mentioned being "down in the dumps" and "on top of the world". Well, yesterday I delivered my artwork to the show at I. Pinckney Simons Gallery. I thought I was just going to drop everything off. All the pieces were nicely labeled, cataloged, and ready to hang. I provided an exhibition list, plenty of extra bios and business cards, and had this paperwork printed on card stock and inside a three-ring binder. 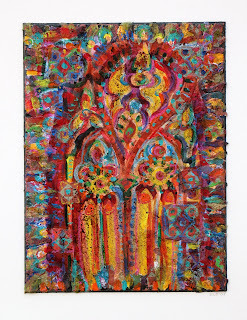 I was shocked to learn that Rick Simons expected, no....required..., Janet and I to actually HANG THE SHOW!. This job took all afternoon. Once finished, Rick Simons announced that he needed....no...required.....typed labels for all the pieces. He explained that clients needed to "see the prices"....not have to turn the pieces over or ask. Sure, I see the point......but, isn't the gallery suppose to do this.....or something? Basically, Janet and I have done all the publicity, paid for the invitations, are doing all the mailing, hung the show....and now I created labels for all the pieces...both mine and Janet's. (How was she going to generate typed labels in Orangeburg overnight and return to Columbia?) Today, I tagged all my artwork and the collaborations. I insisted that Rick had to figure out which tag belonged to which of Janet's works. I've also been "on top of the world". My Archeology Project is right in the middle of the gallery on an ornate round table, a focal point. It looks great. Also, my other show is on the Ironstone Vineyard website! I am thrilled. Steve booked my accommodations (a really sweet deal) at a quaint place called The Jumping Frog Inn. So, soon I'll have an opening in Columbia, a trip with Steve to DC, a trip to Birmingham to see Mathias and ballet, and finally both a trip and opening in California. Yes.....even if I'm rejected from the local McKissick Museum charity event, I'm on top of the world! Art in the New Year! I've been busy! I'm been sad and happy, well and injured, down in the dumps, and on top of the world. 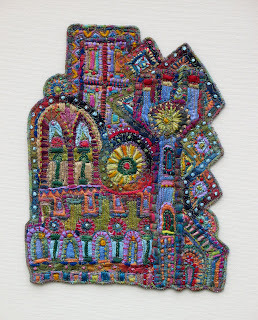 Over the holidays, I hand stitched two more in the Elements of Architecture Series. These were machine embroidered upon my return to Columbia, my studio, and my wonderful Bernina sewing machines. Yet, I've also managed to create four new pieces in my "In Box" series. Posted here is a detail from In Box XII and a full shot of In Box XIX. I planned to upload more images but Blogger is taking more time that I can stand. I'm even reading great portions from my de Kooning book while waiting, but it is still taking too much time. Maybe tomorrow I'll post other images. I created these four In Box pieces in a furor of activity. The annual McKissick Museum of Art's fund raiser is just around the corner. I've been one of the invited artist for the past few years. I've sold work each year. However, this year the event has changed into a JURIED event. Of course, Wim Roefs, our local Dutch art expert, is the juror. I cried when I read the notice. I figured that this was the end of my participation. Alex, however, reminded me that I often spend $30 or more dollars submitting slides or CDs of images to juried shows in which I stand little to no chance of acceptance. This McKissick opportunity carries no entry fee. The only thing different about this juried show and others is that I know the juror who might reject me. (Wim has told me how to reframe my work so that it "at least LOOKS like art". He has admired my In Box series only after I've mentioned that all were sold.) Anyway, I decided that Alex was right. I had no money to lose and already knew the likelihood of rejection. I also figured that if Wim was even half serious about liking my In Box series, I needed to get to work and produce more. So, I made four more. I like making these pieces. They've always sold well. They allow my mind to wander while ironing. I am always rewarded with a feeling of accomplishment. So, now I have four more. The submission for the McKissick charity event (it is called "A Fool for Art) allows ten images. So I sent five from my Life Everlasting Series and one that I did last year about a "fool". 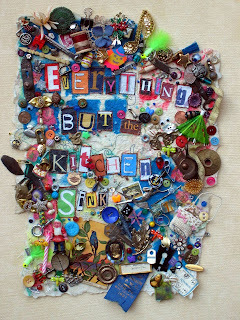 It is a mixed media piece using a quote from Samuel Johnson. I'll post an image tomorrow, if Blogger is up to it!